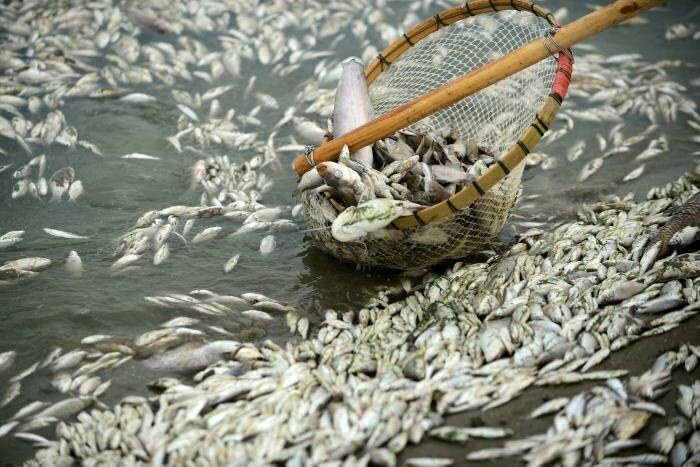 Mexico authorities hired 80 workers to remove thousands of dead fish washed up on the shores of Matamoros, near the Texas border. The massive fish die off was more noticeable on the beach Costa Azul. The Commission of Natural Protected Areas of Mexico said yesterday that the fish died from the so-called red tide, which is caused by elevated levels of a marine biotoxin produced by algae. Meanwhile in Sarasota, Fla. (AP) - Wildlife officials say a red tide in the Gulf of Mexico is to blame for dead fish littering beaches and causing a foul stench at a popular beach along Florida’s Gulf Coast. The Sarasota Herald-Tribune reports (http://bit.ly/2cQco2T ) that beaches in Sarasota County are the only ones currently being affected by the harmful algae. At Siesta Key, state scientists foundthousands of dead fish in the water and on the beach, as well as offshore of Lido Key. Scientists found medium concentrations of the algae, called “Karenia brevis,” also in Sarasota Bay. Tests of water in Pinellas, Lee, Charlotte and Collier counties found very low concentrations. Centerport, N.Y. — Officials say up to 10,000 dead fish were found near a bridge on Long Island about a month after an estimated 11,000 fish died in the area. Town officials in Huntington tell Newsday the adult moss bunker fish died Thursday in Centerport Harbor after they became trapped and oxygen levels fell.